An unexpected pregnancy can be a dilemma on many different levels – personal, financial, spiritual, emotional…and medical. For most women, the immediate medical considerations of an unplanned pregnancy weigh heavily. That initial medical consultation can be fraught with fear of the unknown, questions about personal privacy and other concerns. How to prepare for your first consultation isn’t something that’s regularly discussed, and this post will help to dispel some misunderstandings, discuss specific procedures and also offer encouragement. Receiving medical services and advice can be cause for concern, but Turning Point’s caring, compassionate culture ensures that every woman is given the utmost respect along with the best possible care. Before you experience a Turning Point consultation, it helps to frame your immediate future with positive reinforcement. Here are three encouraging thoughts that will help put your mind at ease. Realize you’re in good hands. Turning Point’s medical assistance is just one part of our overall support system for women involved in unexpected pregnancies. From free pregnancy tests to ultrasounds, our goal is to provide women who need help a confidential and caring setting to talk about their issue, receive medical attention and move forward in a positive, constructive manner. You’ve already made the right decision. An imminent medical appointment can be daunting. Many women immediately relive their past mistakes, making the present moment more difficult than it has to be. Before your Turning Point meeting, give yourself some credit. The best possible future is already underway – you’ve contacted Turning Point and made an effort to receive assistance. Regardless of past decisions, your choice to turn toward Turning Point puts your needs first. Don’t worry about costs. A sudden pregnancy often leads to “pocketbook panic.” All of Turning Point’s services – including your upcoming medical attention – are completely free. So what happens during your Turning Point visit? This part of the process comes after initial meetings, where you’ll complete some paperwork, meet your Client Advocate, provide a urine sample for a pregnancy test and also talk about additional options regarding your situation. Our on-staff Nurse Manager conducts a health assessment, which usually takes less than a half-hour. Assuming you’re eligible for an ultrasound exam, you are then escorted to our medical exam room for the ultrasound. After the ultrasound, you have a follow-up meeting with your Client Advocate. During this meeting, you’ll receive important information to help you make the best possible decision and answer any additional questions. We listen to your unique situation and offer resources and options tailored to meet your needs. If you request a follow-up meeting, we will contact you in the near future to check on your status, discuss additional options and answer any other questions you may have. The total time of your medical evaluation and consultation ranges anywhere from 45 minutes to about 2 hours, depending if you opt (and are eligible for) an ultrasound exam. The Turning Point Pregnancy Resource Center regards every medical consultation as a completely confidential process. 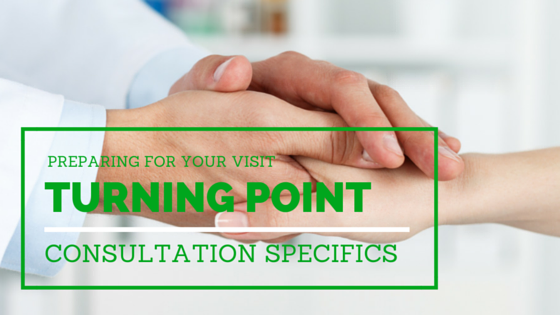 We hope this information helps answer your questions about your first Turning Point visit. For any questions or concerns, please call our office at 858-397-1970.